MEET TOMMY ROE . . . whose single record, “Sheila," burst on the musical scene like a skyrocket and didn't stop until it reached the top spot on the popularity charts . . . who is six feet tall with brown hair and blue eyes . . . whose favorite dinner is fried chicken with butterbeans, corn bread, potatoes and milk . . . who lifts weights and likes football . . . who would like to be an actor... whose favorite colors are blue and emerald green. . .who doesn't like to travel but enjoys meeting people. And when you've met Tommy Roe, you’re not likely to forget him. A more handsome and charming young man hasn't been around. for quite a while. The nineteen-year-old native of Atlanta, Georgia, has all the gentle manners and the honest approach to life that go with his southern background. In his quiet, slow speech, Roe lets you know that here's a fine new talent who knows where he’s going - and he has all the equipment to speed his way! 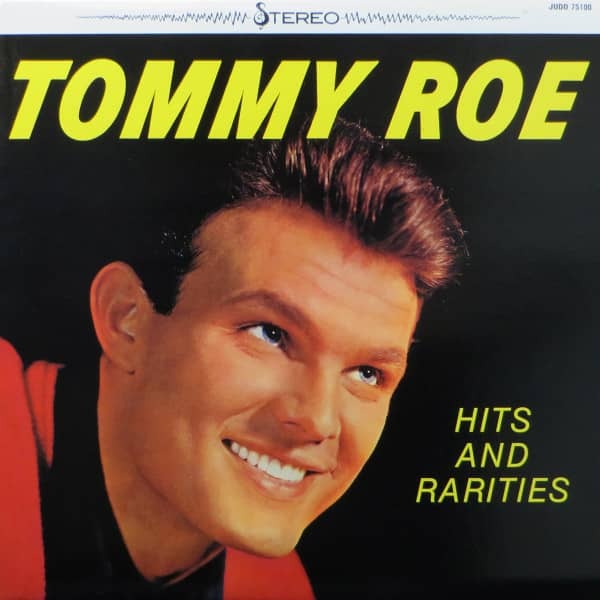 Tommy Roe lives in Atlanta with his parents and younger brother. He graduated from high school in 1960 and has since worked as a test technician for electronic equipment, while squeezing in his musical activities on weekends - and his music is important to him. He teamed up with five other young musicians while still in ninth grade, and the group clicked so well that they've been together ever since. 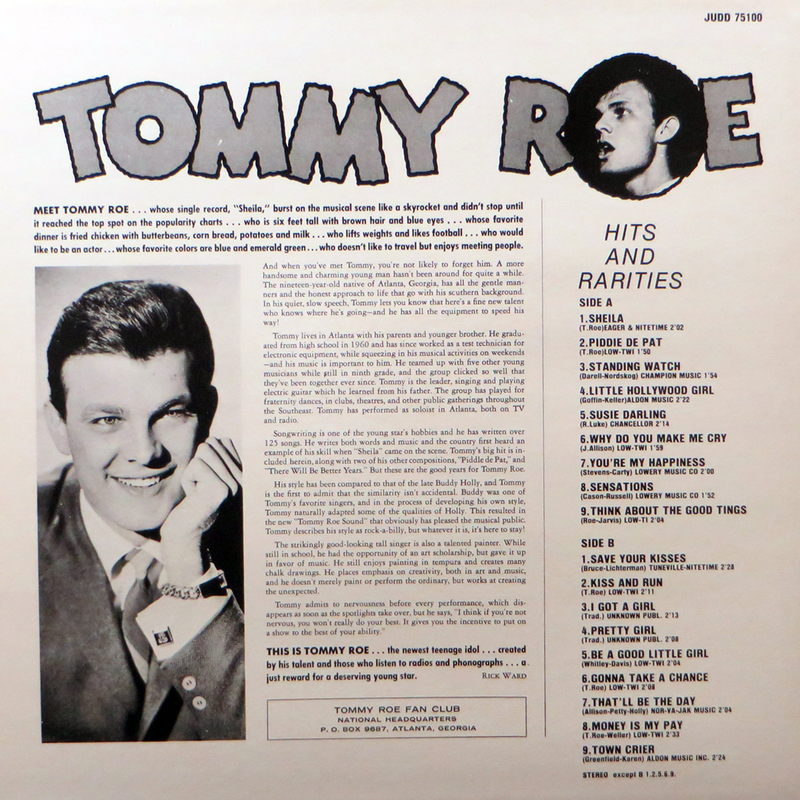 Tommy Roe is the leader, singing and playing electric guitar which he learned from his father. The group has played for fraternity dances, in clubs, theatres, and other public gatherings throughout the Southeast. Roe has performed as soloist in Atlanta, both on TV and radio. Songwriting is one of the young star's hobbies and he has written over 125 songs. He writes both words and music and the country first heard an example of his skill when "Sheila" came on the scene. Tommy's big hit is included herein, along with two of his other compositions, "Piddle de Pat," and "There Will Be Better Years." But these are the good years for Tommy Roe. His style has - been compared to that of the late Buddy Holly, and Roe is the first to admit that the similarity isn’t accidental. Buddy was one of Tommy's favorite singers, and in the process of developing his own style, Roe naturally adapted some of the qualities of Holly. This resulted in the new "Tommy Roe Sound" that obviously has pleased the musical public. Tommy describes his style as rock-a-billy, but whatever it is, it's here to stay! The strikingly good-looking tall singer is also a talented painter. While still in school, he had the opportunity of an art scholarship, but gave it up in favor of music. He still enjoys painting in tempura and creates many chalk drawings. He places emphasis on creativity, both in art and music, and he doesn't merely paint or perform the ordinary, but works at creating the unexpected. Customer evaluation for "Hits & Rarities - Vinyl LP"